After tantalizing you all with the gorgeous intake of that second-generation Taurus SHO last week, we’ve got another one to share. SHOs are already fairly rare cars, but with a bit of poking around, you can find out there were other colors than silver, red and white, and one of those was Mocha Frost (clearly someone was craving a cool, caffeinated drink on a hot day). Beyond that, a limited amount of Tauruses (Tauri? No doubt the vast Ford Taurus enthusiast base will provide an opinion or two) were available with the Plus package tacked on to their SHOs, which included things like a plastic hood with bulge, rear spoiler, and more. However, there were no performance enhancements, so Plus package or no, you still get that sweet V6. 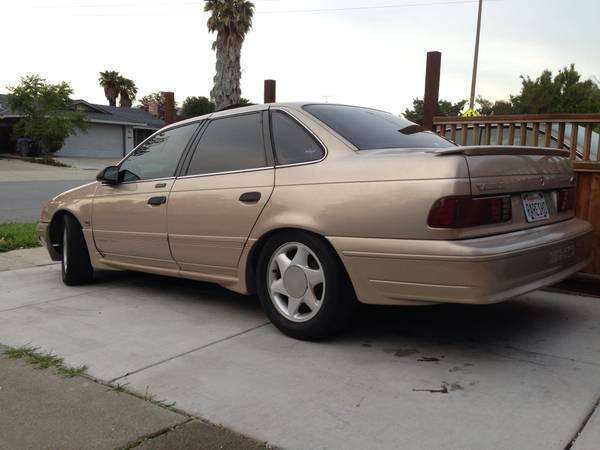 Check out this 1991 Ford Taurus SHO Plus for sale for $3500 in Milpitas, CA. Not content with simply rivaling the Italians with the design of their engine, Ford took it one step further, rivaling them with the inconsistent application of optional extras. This means that some Plus models did not get the rear deck spoiler and some of the other items – as you might imagine, this is a hotly debated subject among SHO nuts. Either way, this car gets the appealing sparkle silver slicer wheels, the 1991-only Mocha Frost color, and blacked-out B and C pillars. People got used to seeing Tauruses since they were such common cars, and as such they might be dismissed, but they’re a handsome car heavily influenced by the Audi 5000. And the Audi never came with a 220hp V6, or a sub-7-second 0-60 time. As they say in another industry, here’s the money shot. 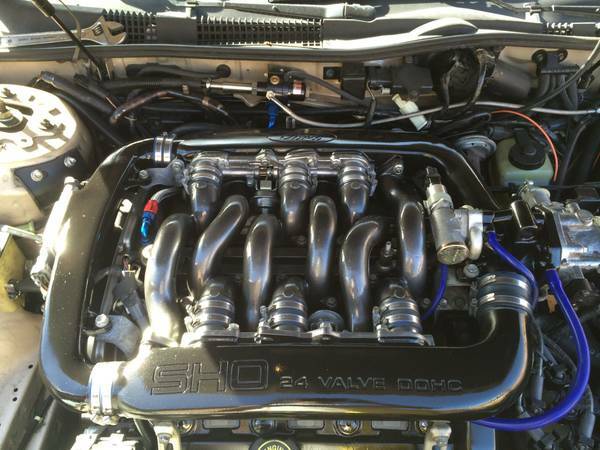 This car has a comprehensive list of upgrades to nearly every mechanical system – engine, transmission, exhaust, suspension, brakes, and more, such that there’s no way the seller is recouping his investment. But that’s not what it’s about, is it – we don’t expect a new car to gain in value when it drives off the lot. The performance exhaust should help bring out the best sound from the engine, and the injectors were upgraded to accommodate a planned turbo. Looking up the plates’ smog check history brings no results, so you’ll want to make sure the modifications do not make the car fail the visual and emissions inspections. 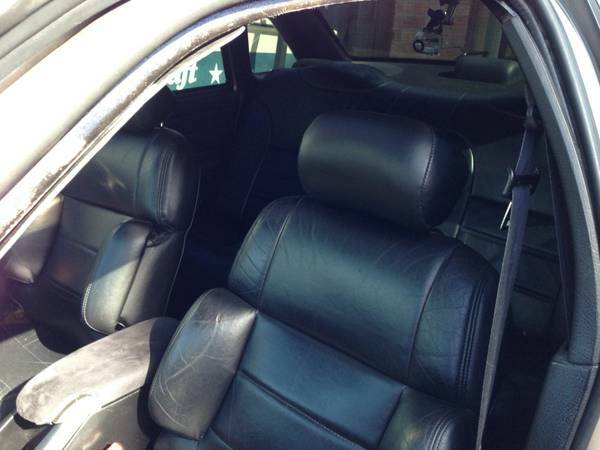 The seats are from a 1995 SHO, and look to be in good shape. Considering the price and the fact this car was based on a mid-range sedan, you can expect some of the cheaper trim parts to have failed, but with 2 million cars produced, one could hope for decent availability of parts. So what would you do with this car? Add it to your $15K collection of post-malaise sport sedans, next to the Saab 9000 turbo, Alfa Milano Verde and BMW 535is? This entry was posted on June 9, 2014 at 1:59 pm and is filed under Feature. You can follow any responses to this entry through the RSS 2.0 feed. You can leave a response, or trackback from your own site. Would you settle for a Lotus Esprit?